Don’t throw away those box lids because I have a fun use for them. 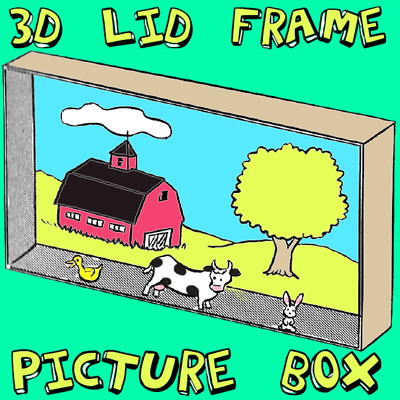 Make these 3-dimensional pictures and use the box lids as the shadow box frame. The pictures seem to come out towards you and that is what makes them 3 dimensional. Find out how to make these with the step by step instructions found below. Paint box cover, either oblong or square and 2″ deep, on both sides with a solid color paint, as in illustration above. Inside the cover, as a background, either paint a scene, or cut a colorful scene from a magazine and glue to background, as in image above. 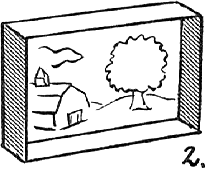 If you want to make a barnyard scene like we did, the draw / paint a barn, some hills, and a tree. Cut out or paint small pictures of people or animals. Mount on cardboard and glue to small slices of cork to make them stand (an adult should slice the cork for you), as in image above. 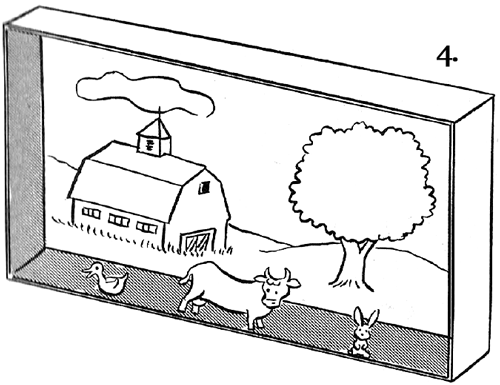 If you want to make a barnyard scene, you might want to try some farm animals such as cows, chickens, pig, horses, sheep, and maybe some ducks. Here are some animal crafts that might help you. 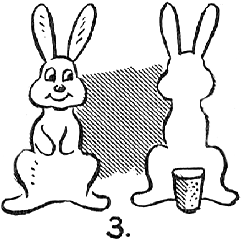 Glue figures in place on floor of picture for 3-D effect, as in illustration above. IF WE HELPED YOU WITH THIS CRAFT, PLEASE HELP US AND SHARE IT WITH OTHERS USING THE SHARE BUTTONS BELOW! MORE USERS = BETTER SITE!!! Use the share buttons above to share this crafts lesson with your friends and family! Thank you! ADD YOUR PICTURE BELOW ... WE WANT TO SEE HOW YOUR CRAFT TURNED OUT ... UPLOAD IT WITH YOUR COMMENTS! All website design, text, graphics, selection and arrangement thereof, and software are the copyrighted works of AllFreelance, © Copyright 2000v- 20018.